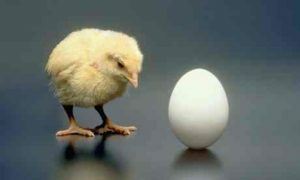 We often find humor in the age-old question, “Which came first, the chicken or the egg?” The topic of life’s order of things is a good discussion to have. When it comes to Scripture, the Bible was written over a 1600-year period. The time of the writing was from 1500 BC to AD 100 when God’s inspired Word was spoon fed to us. So, which of God’s precious words came first? If you guessed Genesis, today’s theologians might call you wrong. The oldest book of the Bible is now believed to be Job, written around 1,500 BC, and not Genesis as you might think. Job takes place during the Patriarchal Age when heads of families offered sacrifices to God (Job 1:5; 42:7-9). And heads of families received instruction from God (Job 22:22; 23:12). It contains no hints regarding Abraham, Moses, Israel, the Judges, the Kings, or Prophets of Israel. Nor is there any mention of the Law of Moses. The rapid drift into idolatry does not appear to have happened yet. Those mentioned still believe in the God of creation (Job 27:3; 33:4-6). There are mentions of the creation (Job 9:8-9; 12:7-10; 26:13; 38:4), the fall of man (Job 31:33, 40; 34:14-15), the flood (Job 12:14-15; 22:15-17), the covenant of Noah (Job 26:10; 38:8-11), and the scattering of the people (Job 12:17, 20-25). Several the ancient tribes or nations still retain names closely associated with those who were scattered: Chaldeans (Job 1:17), Cush (or Ethiopia) (Job 28:19), Ophir (Job 28:16), Sabaeans (Job 1:15), Sheba (Job 6:19), Uz (Job 1:1). And there are other facts in Job that help foster the idea that God chose to inspire mankind by giving us His messages in Job first. Pain is often impossible to avoid but remember, how you suffer is optional. Can you recognize evil when you see it? Do you blame God when things go wrong? Do you know if a neighbor is having hardships? Have you offered to help? Is your joy of life based on this world or God’s world? Can you describe the characteristics of our God? God knew that when He granted mankind free-will, they would suffer due to their own decisions and choices in life. God wanted to tell us that in our suffering, we will never know all the facts as He knows them. God began His story about Job by showing us that there is evil in this world, God has a conversation with Satan. Evil can cause pain and suffering, but evil, despite its impact on mankind, is still subservient to God. We must never forget that God is fully in charge. While Job shows us that to be righteous is a good thing, righteous living did not insulate Job from suffering. He lost his friends, family, home, health and much more. We learn in God’s first story that perseverance and suffering have its rewards and suffering validates our faith and often confirms our love for God. God already knows us better than even we know ourselves so we do not need testing. Suffering, therefore, must be somehow beneficial to us. It would also be wrong to think that suffering is always God’s punishment for sin. Yes, bad decisions, free-will, can lead to physical suffering and pain. The good news is that when this happens, God will use any experience of suffering for good things, to strengthen and grow our faith and to confirm His love for us. In the story of Job, we learn that suffering comes as the result of an unseen conflict in the spiritual world. We are also shown the inadequacy of our reasoning in the presence of tragedy and suffering — we can also see that there are limits on our own understanding. The book of Job clearly tells us that God is sovereign and supreme over Satan as well as our suffering. As a first message, God chose to give us this story first to lay the first cornerstone for our faith. After Job had prayed for his friends, the Lord restored his fortunes and gave him twice as much as he had before. All his brothers and sisters and everyone who had known him before came and ate with him in his house. They comforted and consoled him over all the trouble the Lord had brought on him, and each one gave him a piece of silver and a gold ring. The Lord blessed the latter part of Job’s life more than the former part….. And he also had seven sons and three daughters. Your tip, therefore, is to know that when you are surrounded by suffering, Christ has taught us there still can be plenty of room for patience, love and compassion. Never forget that the story of Job ends in joy.